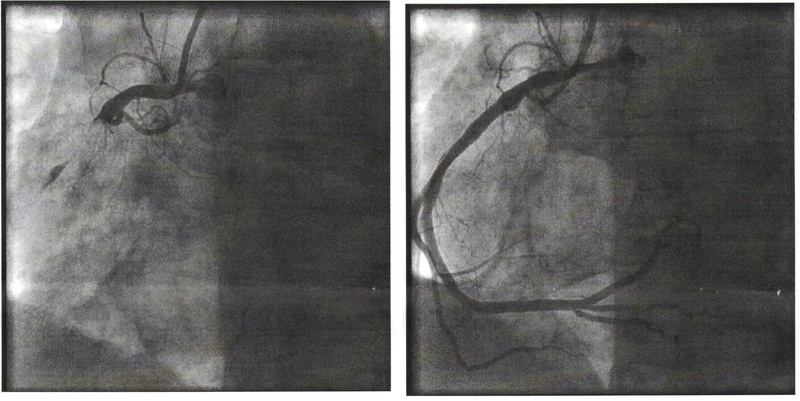 The difference between my 99% blocked right coronary artery and what it looked like after the clot was removed. ~ a time of intense difficulty, trouble, or danger. ~ the turning point of a disease when an important change takes place, indicating either recovery or death. ~ a time when a difficult or important decision must be made. I had a heart attack the last day of June 2014, and, while that would definitely fall under the first definition, my time of “crisis” came a month and a half before that. In the middle of May, I experienced some pain in my lower right abdomen. I was pretty sure I wasn’t having appendicitis because I wasn’t experiencing other symptoms that go along with it. But, to satisfy my husband, I made an appointment with the doctor. During the visit she was fairly certain I wasn’t having any problems with my appendix (temperature was normal and a physical exam seemed to point to a pulled muscle), but just to make sure, I had a scan done. She sent me home and told me she would call me with the results. Non-alcoholic fatty liver disease (NAFLD) is one cause of a fatty liver, occurring when fat is deposited (steatosis) in the liver not due to excessive alcohol use. It is related to insulin resistance and the metabolic syndrome. Most patients with NAFLD have few or no symptoms. This is when definitions two and three listed above kicked in. I reached a point where I had to make a decision as to whether or not I was going to make a change in the direction of recovery or death. I felt strongly that the Holy Spirit was telling me that it was now or never. I saw what the medical outcomes are of NAFLD, insulin resistance and metabolic syndrome. I resolved to choose life. That day, May 10,, I determined that I was going to remove from my diet processed foods and fast acting carbohydrates, which included breads and desserts. By God’s grace, I began to see some signs of improvement. Fast forward the clock to the last day of June, when I ended up in the emergency room, followed by the placement of two stents in my right coronary artery the following day. Some would say that is when I had my crisis. Yes, it was a time of danger, but it really shouldn’t have been too much of a surprise considering all the other indications (labs, weight gain, blood pressure) pointed to the likelihood of a heart attack. But, I had already gone through making the resolution that I was going to change things. By the time I was in the hospital, I had already lost ten pounds by observing my new diet. Now, less that six months later, I have lost over 24 percent of my body weight and dropped two sizes in clothes. I say this by way of encouragement. I purpose not to let the crises I faced go to waste, because I see too many of my sisters and brothers in Christ heading in the direction where I ended up. Many of them, like me, believe the Word of God speaks to every area of life and thought, but have never really applied it to nutrition and health. So, if you are interested in making some serious changes in the right direction, I’d be more than happy to help you get started. After all, there is much work to be done in building the Kingdom of God, and I would like as many healthy colleagues working alongside me in this pursuit. To God be the glory!! Are you on any particular dietary program? I have removed processed foods and bread and pasta from my diet. I will have some rice and potatoes occasionally, but in small portions. I would call my diet mostly plant based, but I will eat grass-fed beef and free range chicken. Smoothies are a big part of getting my veggies. I exercise 4 times per week (combination of swimming and high intensity weight training). I try to get ample sleep and manage my stress by NOT holding grudges and getting things resolved. Andrea, Would you give us an example of what do you put in a typical green smoothie? Until my garden grows, I make use of what I get at the farmer’s market. Typically, I use spinach, kale, celery or lettuce. I rotate between adding cilantro, parsley, and dandelion. I will add a zucchini if I have one. I find that cucumber adds a nice freshness. I use kefir as a base and add banana or apple for some sweetness. Since everyone’s taste is different, experimenting is the key. You can find recipes online.